At permanent courses, parents and group leaders can accompany children until they are competent to go alone or in pairs. They can also choose the standard of the courses to follow to provide a sensible progression of experience. Individuals can choose their own start time, length of course and degree of difficulty. This means one parent can compete while the other looks after children. They can then swap roles. Everyone can thus take part at their own standard without supervision problems. If you are a group leader or teacher taking your group for an orienteering experience for the first time, please don’t put them on the hardest course thinking it will be a real challenge for them and keep them occupied. They will probably get lost and be thoroughly disillusioned. Try them on an easy course first. They’ll whizz around and come back eager for more! The maintenence of a particular POC is the responsibility of the land owner, be it Forestry Commission, National Trust, or a local authority. In addition, we will undertake periodic maintenance checks and advise the land owner accordingly of any work required. Should you encounter a problem, such as a missing post, please advise us through this web site (see contacts page for details), or the land owner concerned as appropriate. It is important to be aware of various issues in relation to orienteering maps in order to understand their limitations. They are not produced with sophisticated surveying equipment. The time involved in such techniques would make the cost of map production prohibitive in relation to the number of people who use them. Maps are usually produced by orienteers, often on a voluntary basis. They use a large scale maps, plans, and aerial photographs to provide a basic outline of the area. Detail is added by pacing measurements, compass bearing and by eye. Orienteering maps show considerable detail but it is not always possible to show everything depending on the scale. A map can be out-of-date as soon as it has been produced. Development work by land owners and the constantly changing nature of vegetation mean that maps may never truly reflect exactly what is on the ground. Local orienteering clubs update their maps from time to time in order to keep pace with changes. Should you feel that there is a genuine problem with any of our maps by all means let us know. With modern computer-based cartography it is becoming easier for local enthusiasts to make minor amendments. The total number of controls on a particular POC will vary, but will usually be between 30 and 40. Each control will have a description which can be used in conjunction with the map to locate it. Each POC will have a number of suggested courses, typically 4, with each course having approximately 12 controls. The courses will vary from a short introductory course for absolute beginners, up to a long and technically difficult course for more experienced orienteers. On the suggested courses, the aim is to visit all the controls listed in the order they are shown, and in the shortest time. Individuals and group leaders should pick a course suitable to the skills of the individual, and not try to run before they can walk! An ideal way for group leaders to teach beginners, and maintain control, is to do Star courses. These involve the beginner going to a single control and then returning to the start for the group leader to check and then issue another control. A further extension of this is the Loop course, where the beginner is issued with a map showing 2 or 3 controls for them to visit and then return to be checked. On a 'score' course, the aim is to find as many controls as possible within a set time. Score courses are usually more fun in a group situation where there is scope for friendly competition. It is possible to allocate points values to controls - higher points for controls which are harder to find or further away from base. Those with the highest points score then wins. When setting up a score event it may be preferable to choose a time which prevents anyone from finding all the controls, with penalties for a late return. This reduces the chance of several people getting the maximum score with no overall winner. Participants are also then forced to think more carefully about which controls to visit. Penalty points are deducted for those straying over the time limit. You set your own points values. Whilst permanent courses have been set up in conjunction with the appropriate local authority and the land owner, these bodies can have no direct control over the manner in which they are used by either individuals or groups. The safe use of these sites is therefore the responsibility of those who use them. Some key points are listed below. Orienteering takes place out of doors, and involves going into areas where there could be some personal risk. Participants should be prepared for such risks. It is recommended that teachers and group leaders complete an appropriate Risk Assessment document for their organisation. Some land owners also require this to be done prior to groups visiting their property. A major aspect of safety is accurate navigation. It is recommended that beginners use the White or Yellow course until they can confidently navigate a network of footpaths or other obvious 'line features' such as walls, fences, streams, etc. In a small area, it is easy to find a route back to the start if a map-reading error is made. Progressing gradually through the colour range is then the best way of gaining the experience necessary to tackle a harder course. Teaching beginners some tactics for 'relocation' when 'lost' is good practice. Part of the fun of orienteering is deciding which route to follow between controls from the information provided on the map. A direct route through complex terrain may take more time than a longer route which is easier to navigate. A direct route may also cross steep terrain, marshy ground, thick woodland, etc which might best be avoided. Any route choice decision should always take into account the orienteer's previous experience for maximum safety. Many areas have features which could be hazardous - ponds, lakes, rivers and crags are obvious examples. Whilst most individuals will treat these with the respect they deserve, it is group leaders who need to have the greatest awareness of them. Group leaders may be managing groups of young people who are not directly supervised and need to be fully aware of potential risks. A prior visit to the site is good practice. Orienteering generally takes place in areas where trees etc may be present. It is strongly advisable to wear clothing which provides full body cover to protect against cuts and grazes etc. At orienteering competitions, full body cover (ie covering the arms, legs and torso) is compulsory. It is essential to have an adult stationed at the Start/Finish point to check off participants on their return. Where physical dangers exist or navigation is tricky, it is desirable to have additional adults stationed at appropriate locations to ensure that safety limits are not exceeded. 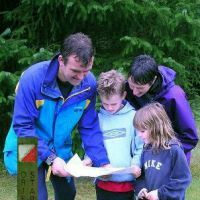 Group leaders should have relevant prior experience or hold an appropriate award from British Orienteering (formerly British Orienteering Federation). 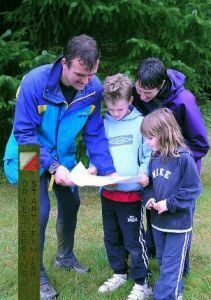 In 2007, with the aid of a grant from the Big Lottery Fund, Devon County Council contracted the implementation of three new permanent orienteering courses (POC) in Devon, and the updating of two more.